(Nanowerk News) A team of UK researchers is embarking on a collaborative project to ensure that the autonomous robots we build in the future will be safer, making decisions that are ethical and follow legislation on robotics. Sandor Veres and flying robotsSandor Veres and flying robots Robots that can think and act without human intervention are moving from fiction to reality. The nuclear, aerospace, manufacturing and agricultural industries are starting to develop autonomous systems that can carry out tasks that are either too difficult or too dangerous for humans, while driverless cars are already with us. He adds: "Each of the three institutions will make a distinctive contribution to the project, with Liverpool’s particular focus being the development and extension of our leading formal verification techniques and tools. These provide strong mathematical proof about the decisions the systems will make and so allow us, in collaboration with Sheffield and UWE, to apply these techniques across a broad variety of complex autonomous systems." 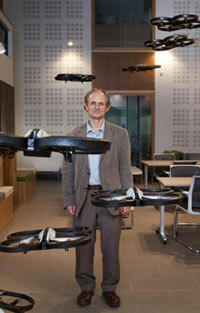 The University of Sheffield brings key expertise in terms of autonomous control, learning and decision-making. "We need robots that can make difficult decisions, but they must also be able to manage this in situations that are complicated by humans,” says Professor Sandor Veres of Sheffield Robotics. Professor Alan Winfield, of the BRL, says: "If robots are to be trusted, especially when interacting with humans, they will need to be more than just safe. We’ve already shown that a simple laboratory robot can be minimally ethical, in a way that is surprisingly close to Asimov’s famous laws of robotics. We now need to prove that such a robot will always act ethically, while also understanding how useful ethical robots would be in the real world."